DUMBARTON produced a thoroughly lacklustre performance at Central Park, Cowdenbeath, against a home side battling for survival in theca SPFL Championship. DUMBARTON produced a thoroughly lacklustre performance at Central Park, Cowdenbeath, against a home side battling for survival in the SPFL Championship in front of a 515 crowd. The visitors knew they were safe from being involved in the play-offs, and in the first few minutes they played in celebratory mode. But soon the home team took charge of the match. It took until just before half-time for the deadlock to be broken. Danny Rogers saved but could not hold a shot from Kudus Oyenuga, and Lewis Toshney was on hand to net the rebound. A couple of minutes into the second half the Blue Brazil scored again, and it was a carbon copy goal. Danny Rogers saved but could not hold a shot from Kudus Oyenuga, and this time Sean Higgins was on hand to net the rebound. 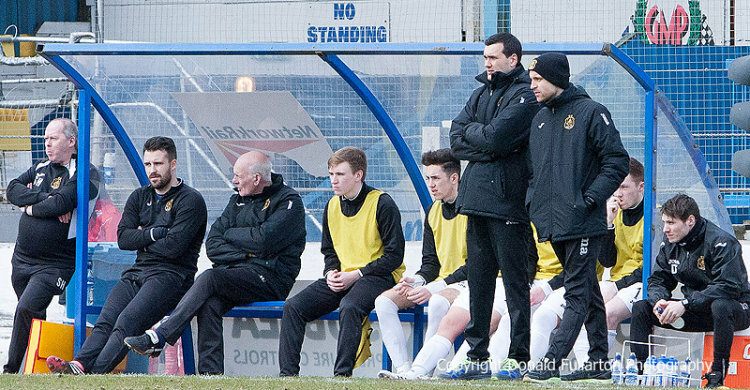 From that point on it was obvious to all — including the Dumbarton bench (pictured in front of a No Standing sign) — that the points were staying in Fife, and insult was added to injury when ex-Sons striker Colin Nish headed home a third goal not long before the end. He had the grace not to celebrate too much, but it served to remind the travelling fans that since Bryan Prunty, now scoring for fun for Airdrie United, and Nish moved on, the team has been woefully lacking in strike power.